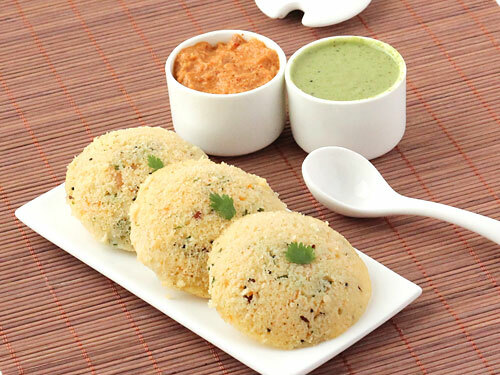 Made with sheer simplicity and ease, the South Indian temptation- Rava Idlis are a quick-fix in the kitchen, especially when you are running short of food ideas! Nutritious, light, and yet filling, kids would love to have it as any time meal, from lunch to dinner. Put in 1 Tbsp of ghee in it, and heat on a medium flame. Add some semolina, and stir. Saute on lower heat to turn it light-brown in colour. Take it out in a bowl and let cool. Mix well with some yogurt in it. Chop green chillies and coriander leaves to add. In a small pan heat 2 tbsps of ghee. Put in some mustard seeds to crackle. When they crackle, add the squashed peppercorns. Saute the crushed cashew nuts a bit, till they are golden. Turn the heat off, and add some curry leaves. Spread this tempering onto the prepared mixture and blend well. Now, put some salt and water bit-by-bit, so that the Idli-batter has dropping consistency. Leave the batter for about 10 minutes. Take the Idli moulds to grease with a little ghee. Keep some water in a steamer to heat. At last, mix some fruit salt into the batter. Place the Idli batter into the moulds. Let it steam for about 10 minutes. Take out from the moulds. Serve hot with the chutney you like.